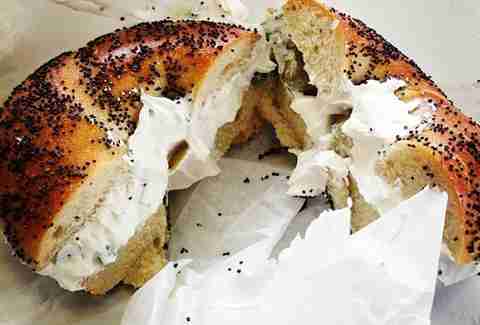 The best bagel shops in NYC are all well and good, but what about when you stumble out of some random person's bed at 7am and are in desperate need of an everything oozing with cream cheese but are NOWHERE NEAR any of those best bagel shops? WHAT THEN, HUH THRILLIST? 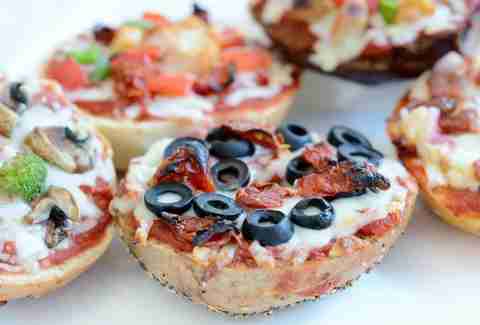 Then this: 30 neighborhoods, 30 bagel shops, all ready to feed you on your stumble of shame home. A large selection of bagels, sandwiches, and spreads dominate this no-frills shop, including an ever-changing cream cheese flavor of the week. A classic shop featuring fresh hand-rolled bagels, Leo’s menu focuses on timeless bagels and spreads, egg sandwiches, deli meats, and smoked fish. This dependable bagel shop offers up a simple selection of dough rings and cream cheeses, plus it's got a huge variety of wraps, sandwiches, and paninis for under $7. 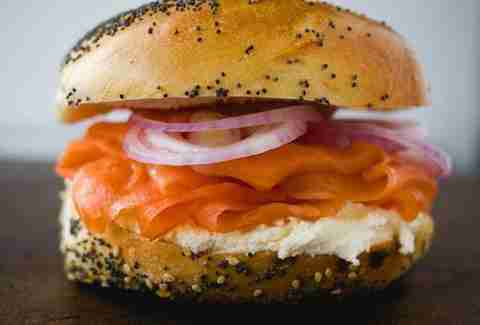 Brooklyn’s answer to Russ & Daughters, Shelsky’s is all about the lox (no treble), with a whopping 10 varieties of salmon to pile onto the substantial selection of bagels and cream cheese spreads. Freshly baked bagels, croissants, and muffins dominate this Brooklyn mainstay with an additional outpost in Staten Island. 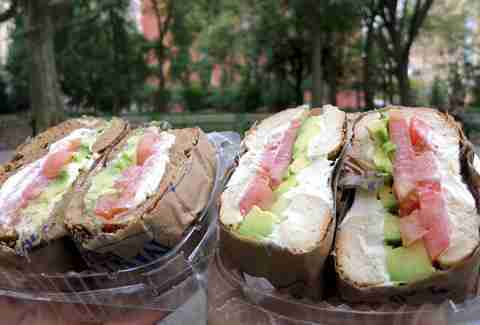 A bona fide East Village institution, weekend lines at Tompkins Square Bagels routinely go beyond the front door. But with hand-rolled bagels, cream cheese flavors like chipotle avocado and jalapeño cheddar, and a large selection of specialty sandwiches for $8 or less, TSB is well worth the wait... for the intern in your office who’s getting everyone bagels. Customers can watch a variety of bagels, flagels, and mini bagels being baked on premises at this Downtown shop, a rare treat that’s sweetened by the massive selection of spreads, sandwiches, and salads. 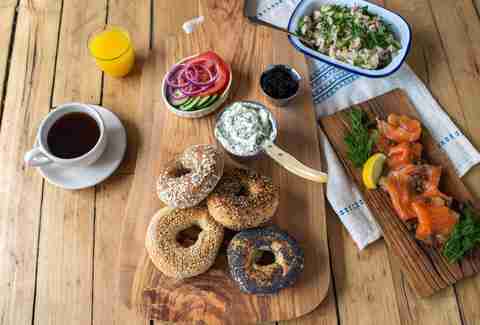 This kosher shop serves up solid bagels and spreads in a cozy no-fuss environment. 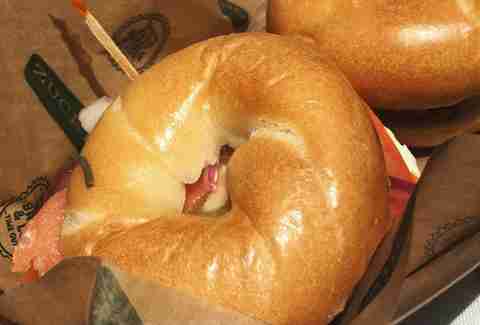 After nearly five decades in business, Bagel Oasis has definitely earned its name. 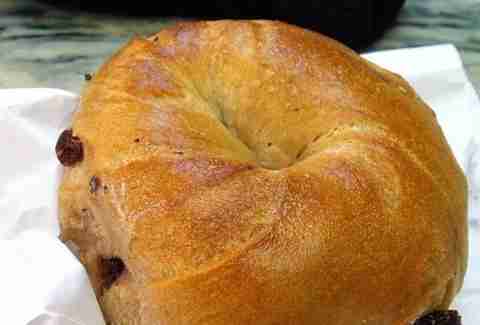 An expert in old-fashioned bagel preparation (the shop uses malt instead of sugar, a key to that perfect crunchy outside, soft inside texture), its sizable selection of spreads and sandwiches only add to its cozy neighborhood appeal. The lines are always long at this Greenwich Village hub, but with freshly made bagels, a solid selection of cream cheeses, sandwiches like the Red Hook Brooklyn (roast beef, Swiss, and roasted peppers), and that Crossy Road app you just downloaded on your phone, it’s totally worth the wait. 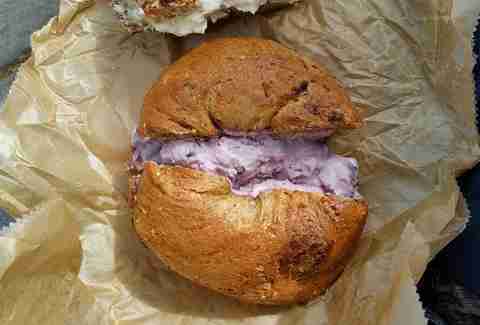 An innovative variety of cream cheese flavors including mango, basil, and banana nut only serve to highlight the dependable bagels and service at this chain’s Gramercy outpost. This straightforward hub for grab-n-go bagels is a commuter favorite, with extra-cheesy BECs and famously rapid-fire service. This sizable outpost on the border of Kips Bay offers a classic selection of bagels and spreads, plus it's got a create-your-own pizza bagel, which is amazing. 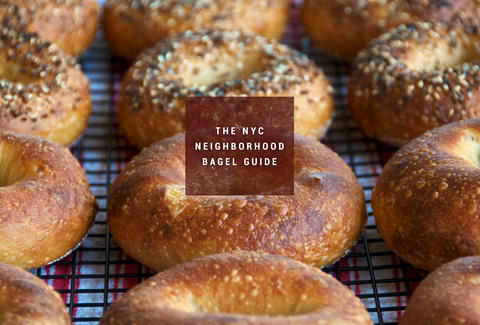 Little Italy is known for a lot of things, but great bagels aren’t one of them. 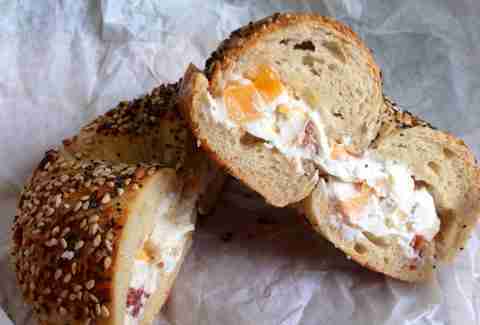 That’s why we’re thrilled to have discovered Baz, where the bagels are crisp, the service is reliable, and egg sandwiches are served all damn day. 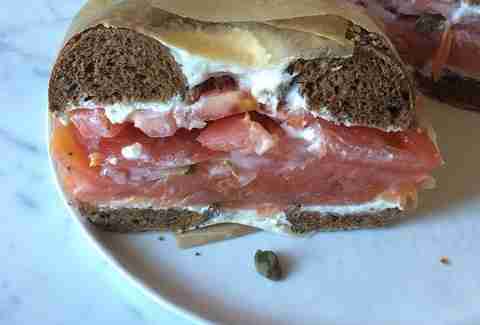 This legendary outpost serves the best bagel & lox in the city, bar none. NONE. 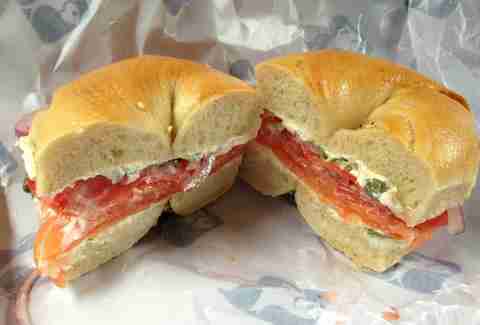 Its Downtown location may be closed, but Ess-a-Bagel Midtown is alive and well with the classic bagels, spreads, and bustling environment it’s become famous for. 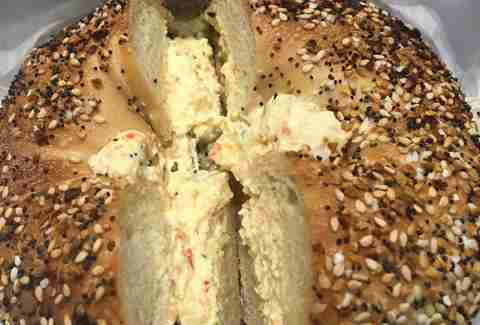 A reliable NY chain for satisfying bagels and spreads in a pinch. 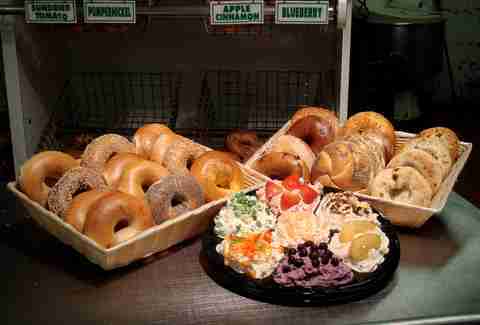 This unassuming bagel shop gets the job done with a variety of circular breakfast options and cream cheeses, cheap prices (just $2.50 for a bagel w/ cream cheese), and egg sandwiches served ‘til 3pm daily. 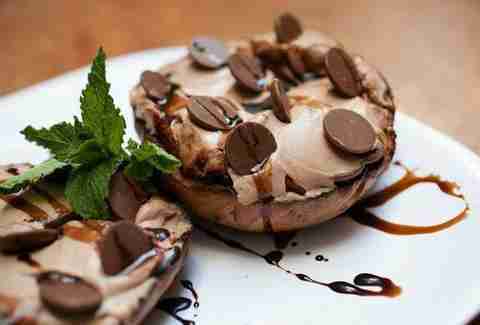 A Columbia campus favorite, this Jewish deli-meets-bagel shop specializes in traditional bagels and spreads, plus it's got famous black & white cookies, which, turns out, aren’t even actually cookies (whaaaaaa?). 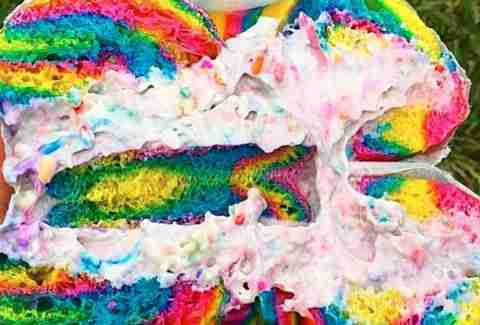 This Insta-famous standout is one of the hottest bagel shops in NYC, and there are plenty of reasons why. 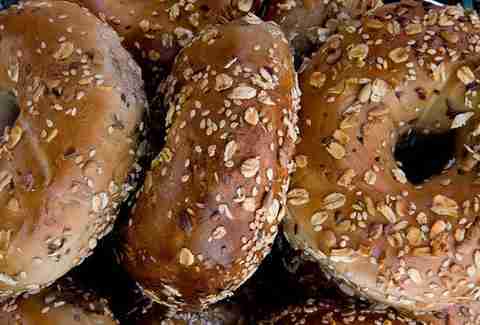 With bagels that’re rolled by hand, boiled in honey water, then baked in a wood-fired oven, Black Seed’s bagels have an unmistakable texture and taste that no one in NYC is matching anytime soon. And when you order up a No. 13 (egg, cheddar, and maple-baked ham) on a toasted multigrain everything? That’s what we call #EEEEEATS magic. This corner shop might not seem like much, but take a closer look and you’ll see why locals have been enjoying the made-from-scratch bagels since 1985, with 11 tasty varieties and counting. All ordering at this no-frills establishment is done through a walkup window, an old-school attribute that only adds to the retro appeal of the classically baked bagels and simple menu that focuses on doing the basics right. Classic bagels, a solid variety of spreads, and a huge selection of smoked fish dominate this family-friendly shop at the tip of Tribeca. 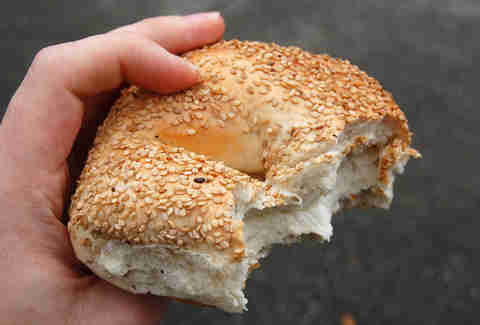 A favorite amongst the NYU set/people who aren’t bothered by confusing apostrophes, Bagel Bob’s delivers classic bagels and spreads at prices anyone can afford. Serving the city fresh bagels since 1974, H&H is a classic shop with reliable dough circles and spreads that’s open 24 hours a day. 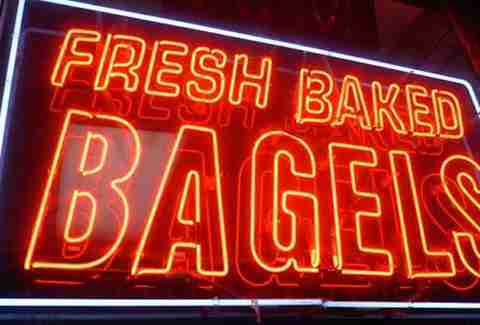 Don’t let the dingy storefront fool you -- these are some of the best bagels in the city, and they’re cheap, too. This timeless shop focuses on classic bagels and spreads at bargain-basement prices -- it’s just $1.80 for a bagel with cream cheese. 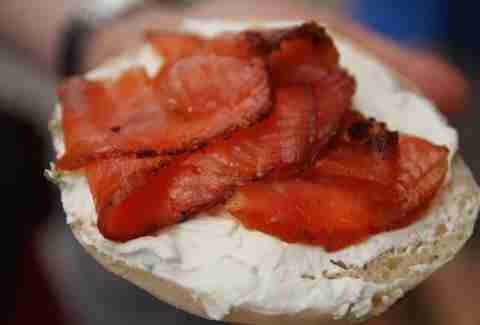 Efficiency can be a rarity amongst bagel shops, but Bagels on the Square has it covered. With rapidly turned orders, an impressive selection of bagels and cream cheeses, and 24-hour service (yes, we’re serious) there’s nothing we don’t love about this West Village outpost. 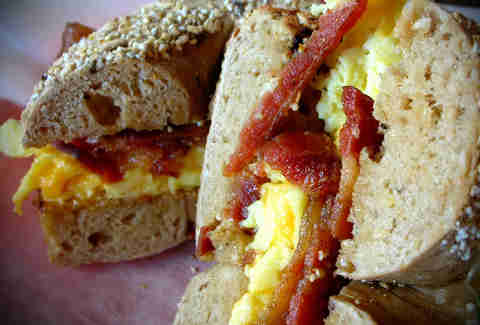 Specializing in old-fashioned bagels served in a neighborly setting, The Bagel Store whips up an impressive selection of bagels including the buttery salted pretzel, egg challah, and an utterly epic bacon, egg, and cheddar cheese bagel.